Can Nest Cameras Be Hardwired: What Are Your Options? A lot of homeowners really like Nest, because it provides so much for a smart home all in one package. From controlling temperature to creating a security system, there are options with the Nest that homeowners may not be able to get in other places. But while that’s the case, some homeowners wonder whether it’s possible to hardwire the Nest cameras instead of having them operate on batteries. The best home security system is one that’s going to be reliable and do what the homeowner needs, and if they want hardwired cameras it could be very important for them to find that option. These cameras could potentially be more reliable — although battery backup would be necessary in order to make sure a power outage wouldn’t completely disable the camera. But that would give two methods of ensuring that the camera worked, and that can mean more peace of mind for any homeowner. It’s not necessary to hardwire Nest home cameras, but more and more homeowners are doing that so they can have everything they want in a system that they feel they can really rely on. 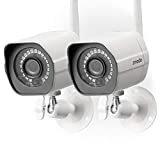 But to hardwire a Nest security camera, a homeowner will have to modify it from the way it is originally, since these cameras don’t specifically come with hardwire instructions and the means to do so easily and efficiently. Is Nest Designed for Hardwiring? With the right security system, Nest can be a very valuable asset. But the Nest isn’t set up to be a hardwired system. That means homeowners have to do something with the cameras to hardwire them in, and that’s not always an easy thing to do. For people who don’t know much about Nest or security cameras, hardwiring a system may not be realistic. But for those who are more tech savvy or who want to learn about electronics, hardwiring a Nest camera can be a great idea. Since the camera isn’t specifically designed for being hardwired, though, there’s some things a homeowner will have to do in order to make it work the right way — and that’s not a problem since it really can be done with some ingenuity. In order to hardwire a Nest home camera, there’s a lot of good information from people who have done it successfully before. Homeowners can learn from the experience of other people, allowing them to get their cameras up and working efficiently. When working with a security company and integrating everything with the Nest camera, it’s important to make sure that all of the other components of the system will work with a hardwired Nest. That way everything can get done at once, and the homeowner can have a truly smart home they feel good about. That peace of mind is important.